The average weight of shoulder is 10 lbs. to 11 lbs. 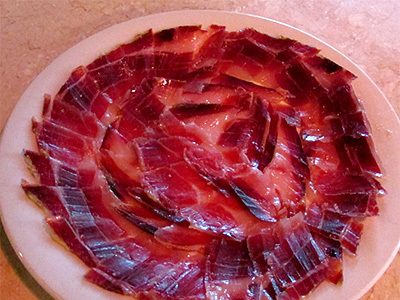 The Pure Iberico Ham de Bellota is probably the best-known Spanish ham in the world due to its quality. 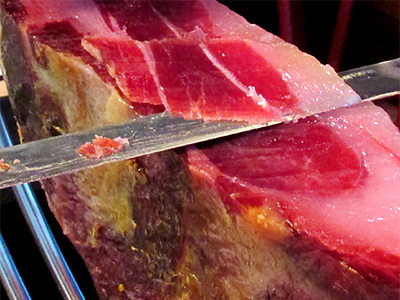 The shoulder pure iberico ham de bellota Cinco Jotas 5J is the main responsible for the excellent reputation of Jabugo. 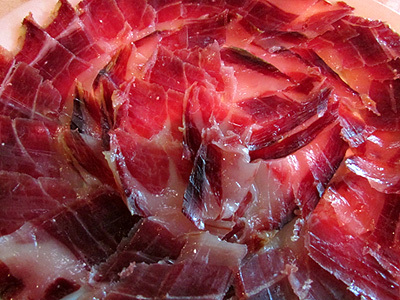 This is a pure bellota ham of persistent and intense flavor, in the style of the hams of Huelva, Spain. An absolute delight for the senses. The shoulder pure iberico ham de bellota Cinco Jotas 5J is a product made from the forelimbs of the Iberian pig, bred in the pastures of the Iberian Peninsula and acorn-fed during the period of mountaineering. In the preparation process the shoulder pure iberico ham de bellota Cinco Jotas is cooled and clipped at V, downgraded from bacon external reservoir, salted, washed, balanced, dried and cured in natural cellars. After a rigorous selection among the best shoulders of pure iberico ham de bellota cured in natural cellars, only those who meet the highest degree all exquisite qualities that characterize these pieces of unrivaled quality are chosen to label as “Cinco Jotas”. 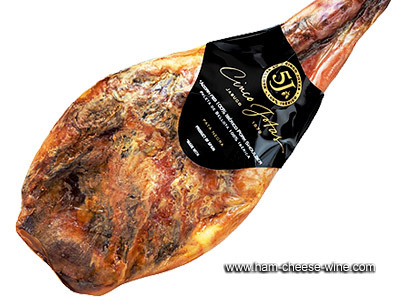 The shoulder pure iberico ham de bellota Cinco Jotas 5J has an exquisite aroma and a unique bouquet flavor. It’ cut has a uniform color with multiple bright streaks of fat infiltrated. This is the most appreciated Spanish Ham in the world. Ingredients: Pure breed Iberico pork, sea salt, seasoning (sugar, sodium citrate, potassium nitrate, sodium nitrite). the product fresh and moist. If you see spots of mold is not anything bad, this can be removed with the same fat or a little bit of olive oil. Something to keep in mind are the small white dots that we can find ourselves in the midst of the shoulder pure iberico ham de bellota called THYROXINE something common that demonstrates that the shoulder pure iberico ham de bellota has been cured successfully. Pure Iberico Ham de Bellota Cinco Jotas 5J, we recommend that you always have a more rigid table that doesn’t move at the time of the cut. The same case for the knives, our company does not recommend using low quality or cheap knives. 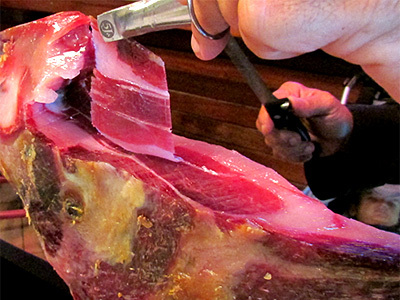 To cut a Pure Iberico Ham de Bellota Cinco Jotas 5J we need three types of knives. The main knife called “Jabonero”, the “Puntilla” for cuts and insert around the bone and, a stronger knife to clean the outer layer. The flavor of a pure iberico ham de bellota Cinco Jotas 5j will depend on your art to cut though the ham, with a fine cut or transparent if possible almost always the flavor of the ham will be much better. reaches your hands. 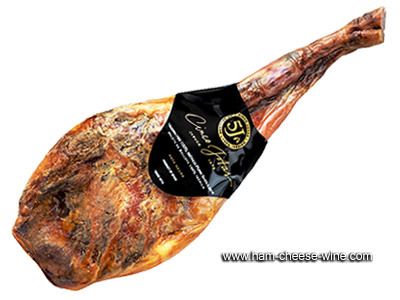 Ham Cheese Wine Corporation brings you now the best Shoulder Pure Iberico Ham de Bellota Cinco Jotas 5J fully guaranteed. Our company was created by Francisco Carrasco, licensed professional master ham cutter from Spain and settled in Miami, Florida, United States. His experience of more than 25 years as a professional ham cutter guarantees you the best product choice of the best product Shoulder Pure Iberico Ham de Bellota Cinco Jotas 5J. dry during the day and wet at night, makes of Jabugo a privileged and unique place to make the best pure iberico ham de bellota. No other place in the world brings such favorable conditions to achieve a maximum quality ham; for this reason Sanchez Romero Carvajal has been for more than a hundred years, since 1879, making the authentic Pure Iberico Ham de Bellota Cinco Jotas 5J in Jabugo. out of the 100% that exists in Spain; the company has control over almost 90% of this pure race. In this town is located the natural park SIERRA DE ARRACENA where the oak tree produces acorns for feeding the pigs, this coupled with the climate in the area make the set in order to breed and get the best ham in the world. The “Montanera” period extends from the end of October to the end of February where the Iberian pigs are fed exclusively on acorns in large tracts of land. The acorn is the main product that seeps into the meat to obtain within 2 years the great taste of a Shoulder Pure Iberico Ham de Bellota Cinco Jotas 5J. The Iberian pig from which Pure Iberico Ham de Bellota Cinco Jotas 5J is created is an animal with a long social, cultural and business tradition and history of Spain. Its origin is not from a single breed of pig but multiple with a common core: the Iberian trunk. Like the wild boar, the Iberian pig is also found within the Sus genre. The ecosystem of the Iberian pig, maximum responsible in the quality of the Pure Iberico Ham de Bellota Cinco Jotas 5J has always been and is the “Dehesa”, a unique habitat with a privileged climate of the southwestern Iberian Peninsula where the pig lives in freedom feeding on acorns, wild herbs and nuts. It is thanks to this pig paradise that pure Iberico ham is a delicious meat and worldwide known as Pure Iberico Ham de Bellota.